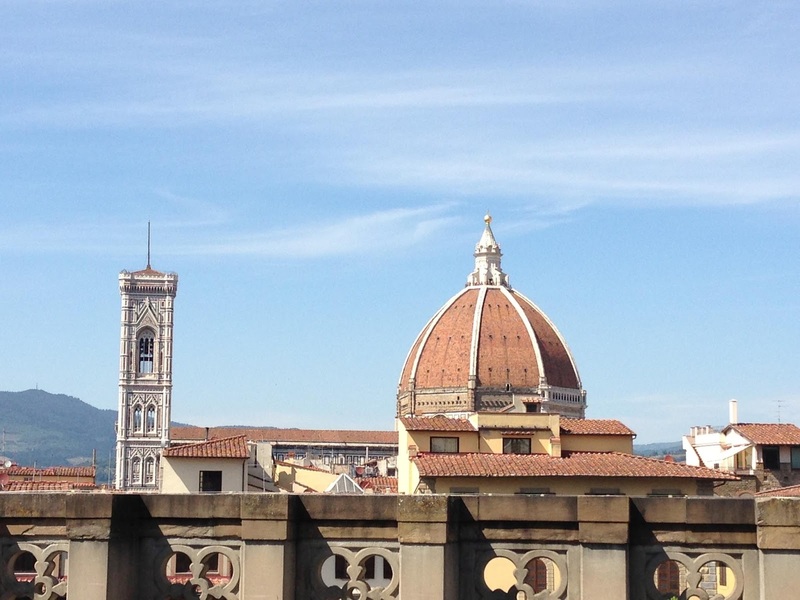 One of my friends, Julie, recently returned from Florence, Italy where she'd spent the month of July studying Renaissance art. The pictures on this page are from her camera. Love the architecture. Julie's an art teacher in our school district. She told me about a day she went to the library in Florence and discovered a book, called Saving Italy:The Race to Rescue a Nation's Treasures from the Nazis. This non-fiction book written by Robert M. Edsel, just happened to be the name of the man who wrote the text book that Julie and her class where studying regarding Renaissance art. She also discovered that it was soon to be a movie starring George Clooney and Matt Damon based on another book by Edsel titled, The Monuments Men: Allied Heroes, Nazi Thieves and the Greatest Treasure Hunt in History. I had never heard anything about these books or the story behind them. Days after Julie returned from Italy USA TODAY (August 8, 2013) ran a feature about the movie stating it's, ". . . about a platoon tasked with going behind enemy lines to retrieve the masterpieces stolen by the Nazis. "Later I found the video trailer on YouTube. You can watch it here. And you can watch it here too. For those of us who thrive on treasure hunting books and movies, and I think there are lots of us, my guess is the movie theaters around the country will be packed on December 18th when the film releases. But for now I'm reading the books and soaking up the information behind the movie. story that is fascinating. I have a feeling it's going to be a huge success. I hope it's as good as it sounds. Hey, if it's got Clooney and Damon starring in it they can't go wrong. If you read the book, page two of The Monuments Men states, "The Monuments Men were a group of men and women from thirteen nations, most of whom volunteered for service in the newly created Monuments, Fine Arts, and Archives section or, MFAA." "Their job description was simple: to save as much of the culture of Europe as they could during combat." 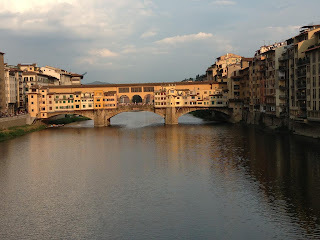 The Ponte Vecchio is this bridge over the Aron River is enclosed and filled with jewelry shops according to Julie, but in days long gone it used to be utilized by butchers selling their meat products as well as tanners. The stench became overwhelming and changes were made. I know I'd prefer the jewelry shops. 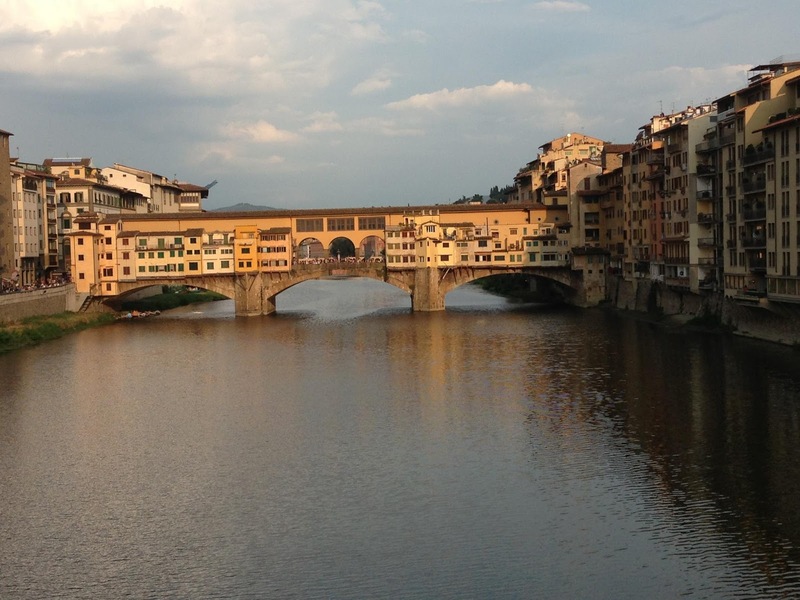 The Ponte Vecchio is the only bridge in Florence that was not destroyed by the Germans during WWII. I've never been to Italy but looking at the hundreds of pictures Julie took of Florence allowed me to get lost in this wonderful world. Have you ever been to Italy? If so, what was one of your favorite places? Do you think you'll go see The Monuments Men movie? 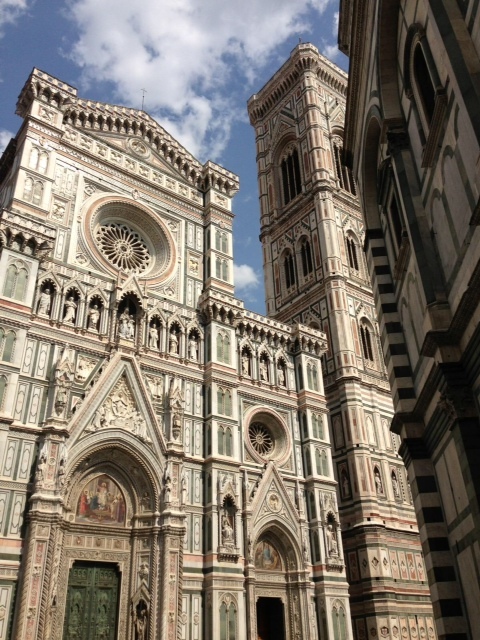 The Basilica di Santa Maria del Fiore, which means St. Mary of the Flower. I found this video on YouTube. This sounds great! I had not heard of the history or the movies. I'll have to check them out. I've never been to Italy and probably never will. I will be looking forward to the movie! It's unlikely that I'll ever get to Italy either but I'll dream about it anyway. You never know. Yes, dreaming is fun; but, reading is almost like being there lol. Jillian, Thank you so much for this very interesting and informative post. My husband and I went to Italy many years ago now but I still remember all the wonder and beauty. It is certainly a place to visit if one has the chance. You're blessed that you got the opportunity to go. If you get a chance let me know what you and hubby enjoyed most. 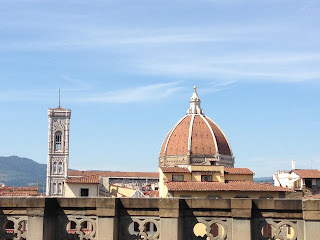 Did you get to Florence? We didn't get to Florence, but in Bologna, the food and the architecture were the two things we most enjoyed. Glad you enjoyed it, Paula. When we can't get to a city we want to visit at least we can have some fun on line and explore that way. I'm glad you stopped by today too! Let's hope that bridge remains stable for a long time to come. I can't imagine trying to rebuild something so old. They must have something in place for repairs to keep it safe. Beautiful architecture! The movie sounds fantastic and I can guarantee you I will be one of those clogging the theaters. (especially seeing as Damon is blessing us with his presence in it!) Thanks for sharing with us! Glad you are enjoying that marvelous architecture. It is amazing. Since the movie comes out in December I'm sure to be one of those folks who will go more than once. With my writer brain I like to go by myself after I enjoy it the first time around with hubby. We'll all have to compare notes later. :) Thanks for stopping by, Susan. Enjoyed your post, Jillian, new info to me. Hadn't heard anything about the movie either - I will probably view the movie, but will probably do so at home - as I do with most movies. P.S. I made it through my surgery earlier this month but spent 17days in the hospital, 7of which were in ICU. It's a good thing I didn't win your book last month b/c I haven't been able to see to read until today. I'm still seeing double and my eyes keep crossing! Hi there, Bonton. Hope you enjoy the movie from home when the time comes. This is one I just won't have any patience to wait to see and love that big screen. Kam, so sorry you had so much trouble with your surgery. That's scary! Praying for healing and wonderful vision to read and watch movies. Thanks for dropping by.